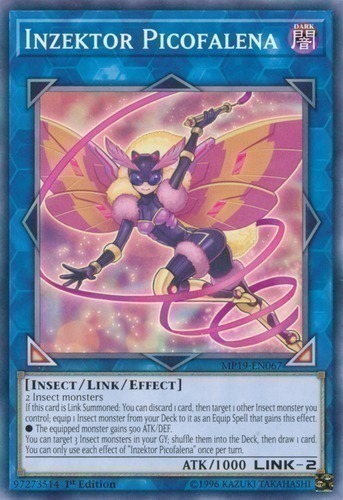 If this card is Link Summoned: You can discard 1 card, then target 1 other Insect monster you control; equip 1 Insect monster from your Deck to it as an Equip Spell that gains this effect. You can target 3 Insect monsters in your GY; shuffle them into the Deck, then draw 1 card. You can only use each effect of "Inzektor Picofalena" once per turn.